Review: 'Alita: Battle Angel' The Eyes Don't Quite Have It Despite a surfeit of impressive talent behind and before the camera, and solid set-pieces, Robert Rodriguez's adaptation of a popular manga about a deadly teenage-ish robot feels thin, and dated. Alita: Battle Angel leaves the Uncanny Valley behind to map the Uncanny Canyon. Eye-yi-yi. A long time ago in a galaxy far, far away, James Cameron worked for Roger Corman, the king of fast-and-cheap exploitation moviemaking. But in the flaming nightmare dystopia of A.D. 2019 Los Angeles, he now takes so long to make movies that the three-to-10-year lifespans of Hollywood trends scarcely trouble him. Case in point: The Cameron-co-written-and-produced — but Robert-Rodriguez-directed — Alita: Battle Angel, which the King of the World first announced his intention to make some 20 years ago. It's a feast for the artificially enlarged eyes, this thing, but who knows what it might've looked like had it come out back then? Probably like The Matrix, the 1999 hard sci-fi landmark with which Alita shares a cinematographer, Bill Pope, and some obvious Asian antecedents — without any Asian cast members. A generation on, The Matrix remains the most complete and widely dispersed cinematic expression of cyberpunk, wherein humankind and its digital tools are increasingly indivisible. The Matrix 's big ideas were as indelible as its set pieces, which makes it a good yardstick for measuring the ways in which Alita disappoints. Expensive and enveloping, the new movie is no chore to sit through. Its big action sequences, particularly one wherein its titular teenage Battle Angel must defend herself from several hulking murderbots (or murder-'borgs) during a game of "Motorball" — it's basically Rollerball, as seen in the 1975 James Caan dystopian sci-fi Rollerball and also the 2002 LL Cool J-Chris Kline disaster Rollerball — are kinetic and fluid, edited with clarity and rhythmic polish. But there's little to chew on once it ends, with startling abruptness, after a mere 122 minutes. The relative brevity does not prevent its tale of an amnesiac teen-girl-identifying robot possessed of deadly fighting skills (which Cameron, Rodriguez, and Altered Carbon creator Laeta Kalogridis adapted from Yukito Kishiro's 1990s manga series Gunnm) from succumbing to Neo-Tokyo drift. Alita is set in 2563 — three centuries after The Fall, when a cataclysmic war between governments of Earth and Mars knocked all but one of "the great floating cities" out of the sky and blasted life here on the Blue Planet back to to its primitive 21st or 22nd century state. Life in the "Iron City," wherein bars and robot repair shops ring a massive junkyard, is more or less like the Old West, with cyborgs — that mostly just look like mechas with human heads — dismembering one another out of petty animus or boredom. Bounty-hunting assassins referred to as Blade Ru— er, Hunter/Warriors enforce order, if not law. Gepetto-esque robosurgeon Dyson Ido (Christoph Waltz) finds an unconscious, limbless lady robot in a scrap heap. He revives her and builds her prosthetic arms and legs, the better to practice her Panzer Kunst with. 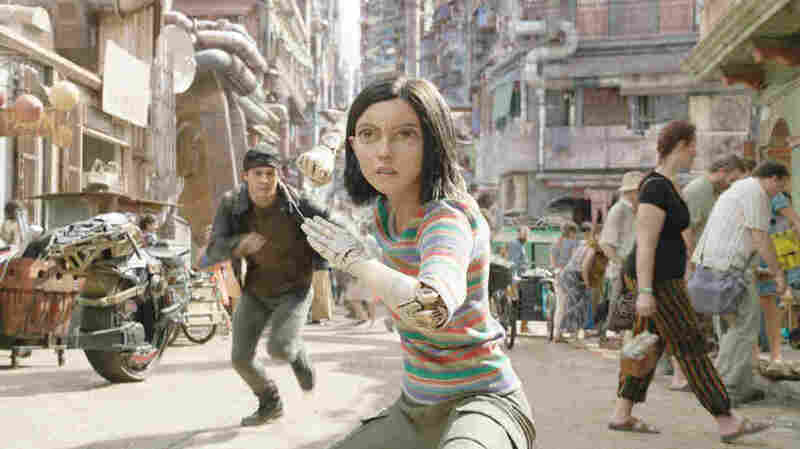 Waltz's casting, and that of Rosa Salazar as Alita, have invited charges of whitewashing, though Alita creator Kushiro has defending the filmmakers by saying he never gave his futuristic story an Asian setting or explicitly Asian characters. You can buy that or not, but Salazar is remarkably good in her performance-capture role, wherein her body and, more alarmingly, her eyes have been replaced. (This methodology also makes it easy for Alita's acrobatic martial arts to be performed by doubles wearing her face, without the telltale blurriness that has often accompanied digital mug-swaps.) Those billiard-ball sized eyes — intended, I guess, to replicate the way the human face is typically depicted in manga and anime — seem like a pricey alteration that might alienate some potential ticket-buyers, but they cease to be a distraction after a few minutes. Salazar still comes off as less like a mannequin than her "meatboy" beau Hugo, played by Keean Johnson, a haircut in a leather jacket who makes Avatar's Sam Worthington look like Daniel Day-Lewis. Still, she's smitten. "I'd give you my heart," Alita tells him, withdrawing it from her fully-armored, microprocessor controlled chest cavity and holding it out to him like poor Yorick's skull. Later on, Alita uses a sword to cleft one of her own salty tears in twain before it hits the floor, and later later on, she uses the blood of a just-slain dog as warpaint. Her flair for the dramatic is as advanced as any human's. That so much screen time is devoted to the budding Alita-Hugo trans-species romance makes it clear the movie aims to cater both to the transhumanists who love the Wachowskis, the the tech-noir fetishists who revere Cameron's influential sci-fi pictures, and the YA crowd that made the Twilight and Hunger Games franchises so popular. (Longtime genre fans will appreciate that alumni of several culty sci-fi pictures make cameo appearances.) But like the latter series, Alita too often feels thin, despite a surfeit of heavy-hitting talent. I haven't even mentioned Mahershala Ali or Jennifer Connelly yet, perhaps because these two Oscar-winners both seem more dwarfed by the sets and the costumes and more defeated by their dopey dialogue than do their less-experienced castmastes. The Iron City, which Rodriguez built at least in part as a practical set on the grounds of his Austin, Texas film studio compound, is a problem: Nearly every character in the film is driven by a desire to escape it, and to win admission to the floating overhead pleasure dome of Zalem. But life down in its shadow never seems all that bad — it's certainly sunnier and cleaner and more inviting than 2019 as Blade Runner foretold it back in 1982. They have fresh oranges (and robots who enjoy eating them, despite their lack of any obvious, um, alimentary components). Everyone appears to have showered that week, if not that day. "It looks like Barcelona," my seat-neighbor whispered, after the fifth or ninth line about what a wretched waste of purgation and sorrow this place is. Still, if you've ever loved manga, or the Wachowskis, or Cameron's stuff, you kinda do have to see this thing in the theater.